Economical second floor walk- up condo. Sleeps 4, 2 bedrooms, ( queen, 2 twins ), 1 bathroom. pets allowed. Shared Pool/BBQ area, CITY PERMIT # 2015-091975 NEW LOWER RATES !! This new condo with all new furnishings is a ground floor 2 bedroom, 2 bath that will sleep 6 people. 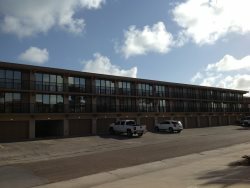 The complex is directly across the street froim the beach access. The complex has a nice pool and designated parking spaces. This property is located on the nothern ( quieter ) part of the island.